Miss. Pallavi Bapusaheb Yadav is student of Std. II Marathi Medium. 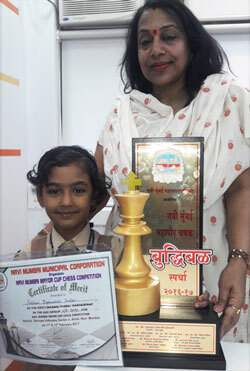 She has participated in Navi Mumbai Mayor Cup Chess Competition organized by Navi Mumbai Municipal Corporation held at Airoli, Navi Mumbai on 11th and 12th February, 2017 and secured First Place in U/9 Girls age group.